MicroNeedling can provide dramatic improvements for multiple skin problems such as acne scars, stretch marks and signs of aging. It stimulates the body’s rejuvenation process to prevent and even reverse the signs of aging. Treatments take under an hour, with patients back on their feet immediately and their skin healed and glowing after only a few days. The procedure itself has been around for almost 50 years but has recently gained in popularity as an add-on or alternative to laser and injectable treatments. MicroNeedling has also become popular thanks to celebrities like Kim Kardashian and Gwyneth Paltrow publicizing their use of the therapy. The Epidermis – is the outer layer of skin that provides a waterproof barrier and makes our skin tone. 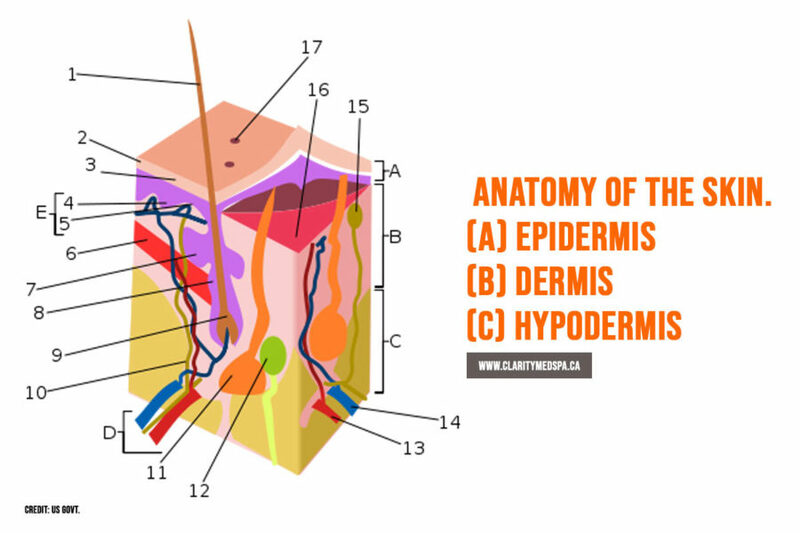 The Dermis – is the middle layer that contains tough connective tissue and also our sweat glands and hair follicles. The Hypodermis – is the deep subcutaneous tissue made of fat and connective tissue. Micro Needling, also known as Collagen Induction Therapy (CIT), is a non-invasive skin tightening treatment that can be used to treat diverse skin complaints, including reducing scars, stretch marks and signs of aging. It involves a dermatologist using a handheld device with tiny needles on the head that makes minuscule needle punctures into the epidermis (the top layer of skin). 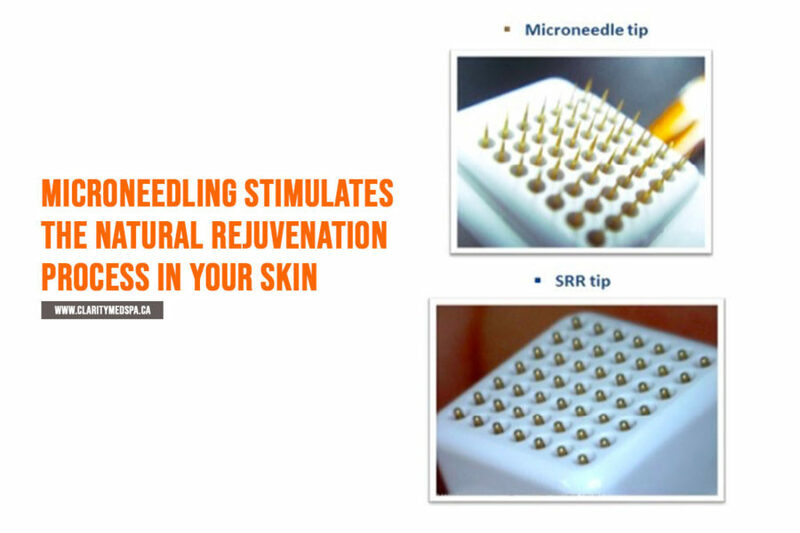 These slight skin pricks activate the body’s natural healing processes, stimulating collagen and elastin growth. A more advanced form of therapy is INTRAcel™ Micro Needling, which integrates radio frequency (RF) into the MicroNeedling process. The RF penetrates the dermis, stimulating collagen and elastin growth deeper in your skin, resulting in even firmer, tighter, and younger-looking skin. Collagen – is a protein that helps hold the structure of our bodies together. It is found in the dermis layer of the skin and provides support and flexibility to skin and gives a tight and lifted appearance. Elastin – is also a protein found in the dermis layer of the skin. It also provides structural support and helps tissues “snap back” to their original shape after being stretched. Dermatologist recommended, MicroNeedling can be effective for the treatment of scars, stretch marks, and fine lines due to aging. For enhanced results, INTRAcel™ uses fractional microneedles and non-invasive electrodes to deliver RF (radio frequency) energy deep into the dermis, triggering your skin’s natural repair response. The combination of deep Radio Frequency penetration into the skin and the body’s natural wound-healing process helps the skin regenerate itself. It is best to talk to a licensed practitioner who can provide you with a consultation on the best options for treatment. Scars are the result of the body’s normal biological wound repair process. When the skin is injured, your body works to repair the wound. It works to reconnect the tissues that were torn by producing collagen, which is a tough connective protein that gives your skin strength and flexibility. While your body does this repair work, your body creates a cover over the wound, called a scab, to protect the wound from germs and further injury. When the wound is healed, the scab falls off. Sometimes this leaves a scar. Scars can be different colours, including pink, brown, or silver. If you’ve had severe acne, you could also have acne scars. These can be deep pits or wave-like lines. 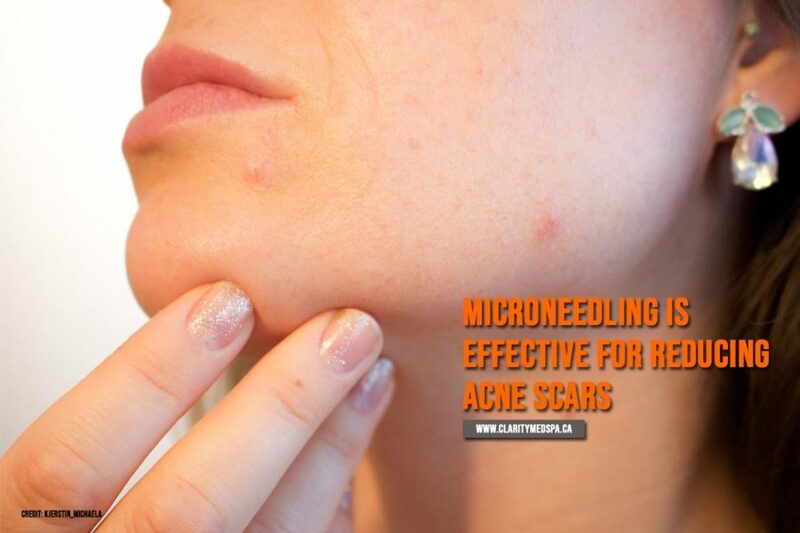 Studies have shown that MicroNeedling is highly effective in reducing the visibility of acne scars. While there are at-home options for microneedling, professional-grade MicroNeedling therapies like INTRAcel™ used by a facialist or dermatologist are far more effective than an at-home device. Talk to a professional to determine the right treatment for your scars. Stretch marks form in the dermis, the middle layer of skin, when skin tissue is stretched beyond its elasticity. This may happen during pregnancy, puberty, or any time of rapid growth. The skin typically grows slowly, and the connecting fibres in the dermis grow and stretch along with it. However, if the skin grows too quickly, the dermis tissue can’t keep up and tear, allowing the scarring patterns we call stretch marks to form. MicroNeedling is effective in reducing stretch marks because it can fill in fine lines, reduce the discolouration accompanying scar tissue, and can help smooth out uneven textures. It is a simple and effective treatment for stretch marks. As we age, we lose some of the elastic tissues in our skin (collagen and elastin), and this causes the skin to hang more loosely. Our skin also becomes more transparent because of a thinning of the surface layer of the skin (the epidermis) due to our blood vessel walls thinning. This can cause wrinkles, saggy skin, and other signs of aging. MicroNeedling can reverse these signs by stimulating the production of collagen and elastin in the areas of the skin that need it most. What is the Procedure for MicroNeedling? The procedure begins with an in-depth skin consultation with a dermatologist to determine the best procedure options for your skin type. Next, the skin is cleansed. A topical anesthetic will be applied for added comfort. Then, the hand-held unit is placed over the skin. Microneedles project from the device and penetrate the top layer of the skin. RF heat is transmitted through the insulated needles, and then the needles are withdrawn from your skin. The hand-held unit is then moved along to repeat the process. Depending on the sensitivity of your skin, cooling systems may be applied following treatment. The procedure itself is not entirely painless, but any discomfort is short-lived. You will feel a prickling sensation, as well as the warmth from the RF heat during treatment. Professionals can adjust the therapy based on your pain threshold, and may also offer numbing creams to relieve discomfort. Most dermatologists have more than one therapy option that provides the benefits of MicroNeedling. The cost of treatment will depend on the therapy used and the number of procedures required for your skin condition. Talk to your dermatologist to get a consultation to find the right MicroNeedling solution for your skin. After MicroNeedling, your skin needs time to heal. You may experience pinprick bleeding which will quickly go away. Your skin may feel like you have a minor sunburn for a few hours and will stay red for up to a day following treatment. Your skin will feel dry and flaky at first; this will go away over a few days as the skin heals. If you have treatments around your eyes, there may be some puffiness for up to three days. It is possible, but uncommon, to experience mild bruising. Topical aftercare products, such as aloe vera gels and cold compresses, will help reduce irritation and speed the body’s natural healing process. Ask your facialist or dermatologist about which aftercare products would be best for you. If you are in the Toronto area and would like to give MicroNeedling a try, visit us at Clarity Medspa & Laser. We have over 23 years of experience caring for skin and offer many options for MicroNeedling treatments for scars, stretch marks and signs of aging. Give us a call at (416) 960-2222 or send us an email for a free consultation.